This article discusses the current phase of a multi-year development effort to provide a computational method for determining static and dynamic stability and control characteristics of USAF high-performance fighter aircraft. The focus of this work is on the virtual flight test capability achieved by incorporating a pilot model, the F-16 flight control system (FLCS), and six degree-of-freedom (6-DoF) motion computation into the CFD maneuver simulation. Flight test maneuvers were performed in a virtual environment by using CFD to determine the forces and moments acting upon the aircraft and allowing the aircraft to respond as governed by the pilot model, FLCS, and 6-DoF. Virtual flight test simulations were accomplished with a full-scale F-16C aircraft using unstructured, viscous, overset grids and Cobalt with a MATLAB interface. Virtual flight test maneuver response is shown to compare well to validated, flight-test corrected data. This marriage of capabilities is rolled into a software suite known to the developers as COMSAC, which stands for COMputational Stability And Control. Creating an accurate representation of a real-world flight test maneuver in a virtual environment involves the cooperation of several components, each performing a specific task related to the execution of the maneuver. 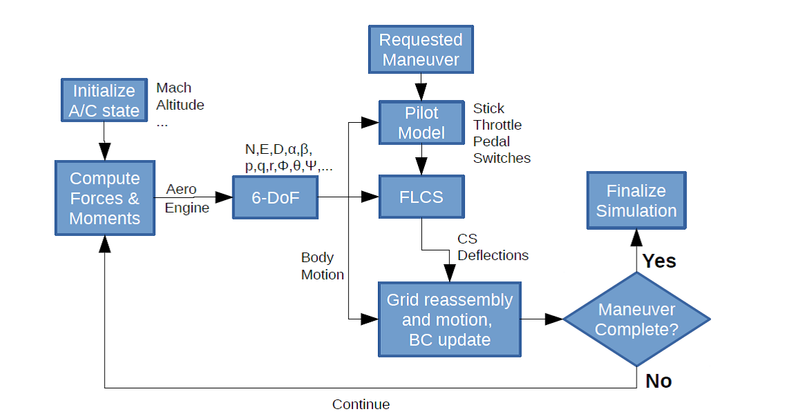 A flow solver providing forces and moments communicates with a pilot model, FLCS, 6-DoF motion solver, and an engine model to accurately simulate the aircraft in flight. The figure below illustrates the basic flow of the simulation. The flow solver of choice in the current work is Cobalt. Cobalt has built within it the capability to accept external control to manipulate both the grid motions and the surface boundary conditions (BC) during computation of the CFD solution. This ability allows the user to alter both the grid positions for articulating control surfaces using motion control and, for instance, the thrust setting from the engine exit using BC control. Also, 6-DoF code can be coupled with the external control code to have the aircraft react realistically to the changes in forces and moments caused by control surface articulation and boundary condition inputs. 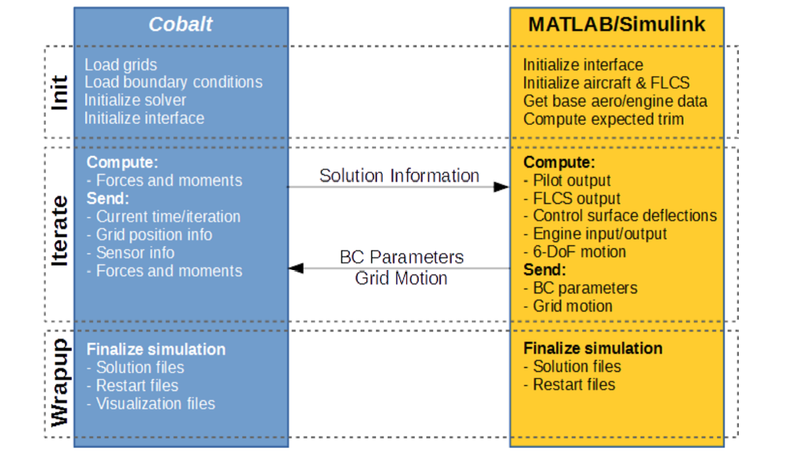 External control is handled via MATLAB using a MATLAB interface built into Cobalt. The user’s scripts, written in MATLAB/Simulink, may adjust boundary conditions and/or move grids, overset or not. This capability allows the user to incorporate such custom enhancements as FLCS computation, 6-DoF motion, engine models, pilot models, or any other influencing factor the user desires into the simulation. The figure below diagrams the basic flow of a Cobalt simulation utilizing external control. 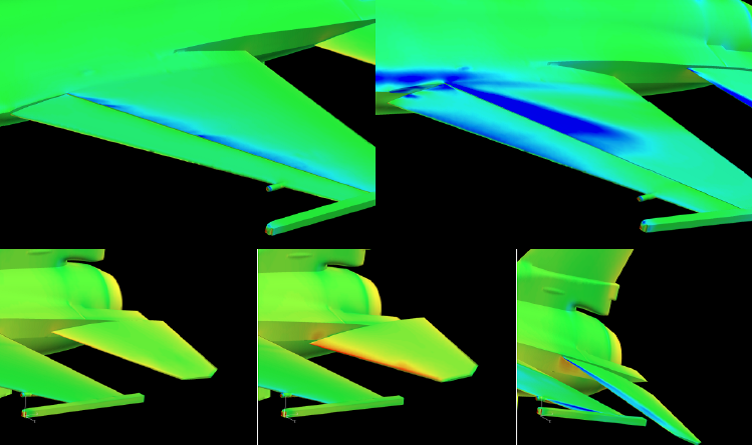 The next image depicts the F-16 horizontal tail and LEFs at different instances during a pitch doublet simulation. The horizontal tail is shown at center, maximum leading edge down, and maximum leading edge up deflections, and the LEF is shown at the starting in-flight condition and maximum leading edge down deflection. Color contours depict pressure variations over the surface during the maneuver. A virtual maneuver was performed in COMSAC using Cobalt on DoD HPC system Spirit. The maneuver was executed on 2048 processors, and the average computation time per iteration was approximately 31 seconds. The maneuver was restarted from a pre-trim solution at Mach 0.6 and 10,000 ft. The control surface deflections were commanded as direct signal injections to the control surfaces computed as Schroeder-phased, multi-sine input signals while the pilot stick, pedal, and throttle inputs were held at trim values. The FLCS distortion of the input signals was not accounted for in the design of the input signals. The same maneuver performed locally in COMSAC using the ATLAS database served as validation data. The image below shows the lift, drag, and pitching moment coefficient traces throughout the maneuver. The virtual flight test maneuver shows good agreement against the same maneuver computed with validation data for both force and moment coefficients. Trend and magnitude are seen to match well. Linear models of the six primary stability and control coefficients were generated using parameter estimation techniques on the data obtained from the virtual flight tests. New longitudinal and lateral-directional maneuvers on which the models were not based were run in LM ATLAS and served as validation data. Two sets of models were generated. The first model set was obtained using data from the aforementioned virtual flight tests conducted locally in COMSAC using ATLAS data. The second was obtained using data from the same flight tests conducted on HPC resources in COMSAC using Cobalt. The side force, rolling moment, and yawing moment model predictions against the new lateral-directional maneuver are shown below. For all coefficients, trend is captured quite well throughout the maneuver while magnitude is predicted marginally well. Of note again is the similarity between the predictions of the ATLAS-based and Cobalt-based models. A method for performing virtual flight tests of high-performance fighter aircraft using high-resolution CFD has been presented. The approach presented herein utilizes the high-resolution CFD solver Cobalt run on HPC resources coupled with full 6-DoF computation, FLCS simulation, an engine model, and a pilot model. The method utilizes a full-span, full-size overset aircraft grid with articulating control surfaces to simulate the response of an aircraft to pilot stick inputs and/or directly-injected control surface deflection signals. Results compare favorably with Lockheed Martin validation data. For further information, you can read the full paper, Virtual Flight Testing of High Performance Fighter Aircraft Using High-Resolution CFD, by Ratcliff, Bodkin, Clifton and Willis.